To avoid spoilage in your grain silos and bulk storage facilities you need a high-quality and reliable temperature monitoring system. Our TMS2500 is a compact portable hand terminal with built-in memory for documented temperature monitoring which also includes a PC Software package that can give you a quick overview of temperature readings. After installing the temperature sensor lines and related hardware you simply connect the hand terminal to the connection point and start measuring and logging the temperatures from each silo. This solution is for those of you who need an easy, automated way to track temperature statuses. You will be in control and gain knowledge of what is going on inside your silo or bulk storage facilities. This system also gives you detailed historical information. Temperature diagrams and tables are generated to present temperature trends which are analysed over time. Our approvals for ISO90001 and ATEX are integrated parts of our in-house Quality Management System. Every single product goes through a 24-hour test before leaving our facilities in Denmark. Ready to find a dealer? Every silo facility needs accuracy and a reliable temperature monitoring system. Our TMS2000 is a basic, professional handheld terminal and read-out unit. This system is flexible and can be extended at any given time. Perfect as a reliable and easy starter system for monitoring temperatures in your silos or bulk storages. Our TMS2500 is a compact portable hand terminal with built-in memory for documented temperature monitoring which also includes a PC Software to give you a quick overview. This system also gives you detailed historical information. Temperature diagrams and tables are generated to enable temperature trends which are analyzed over time. Take full advantage of the benefits of the new technology and let our Agrolog grain and crop quality management system give you the strong tools you need to always be in control of your grain and crops. 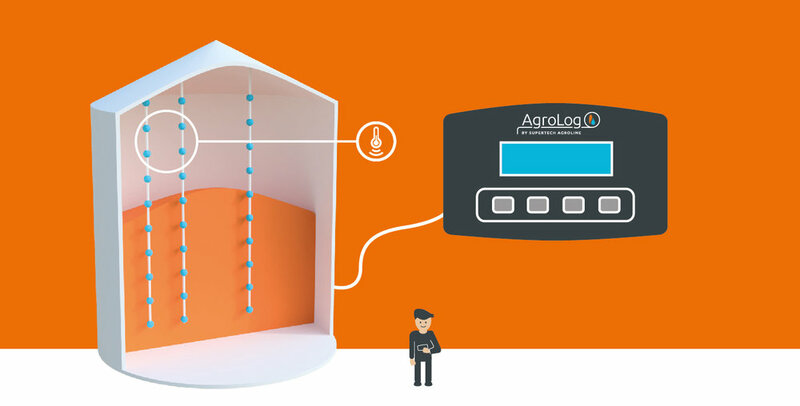 Agrolog by Supertech is for you who need a fully automated Temperature and Moisture Monitoring System to make your daily workflow easier and much safer. Our dealer makes sure you get the right solution installed.